Well, the weather outside has quickly turned from a mild Autumn of wind and rain to a wintery mix of cold and snow…I fear that our Midwest winter weather is here to stay for a while. This recipe is perfect for a cold and dreary day indoors while the snow falls outside. 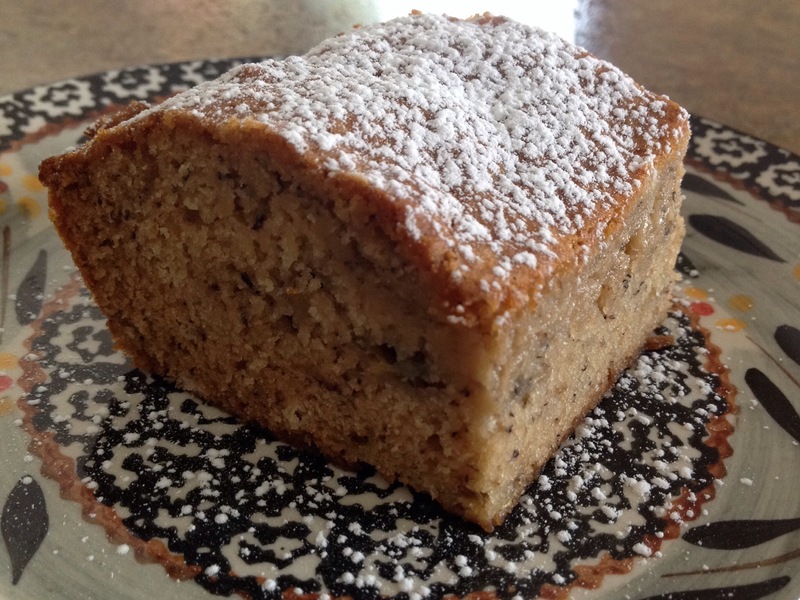 I love to brew a cup of English tea and slice up this moist and flavorful cake. I am always amazed that mixing this simple list of ingredients together can produce such a delicious treat. By the way, this is a another great cake to pack in the lunchbox. In a large bowl, combine flour and baking soda. In another bowl, whisk brown sugar, water, banana, oil, and vanilla. Stir in dry ingredients, just until moistened. Transfer to greased 8″ square baking pan. Bake at 350 degrees for 30-35 minutes. Cool. Dust with confectioners’ sugar. Oh, thank you… I will check it out! Happy baking! So true ” I am always amazed that mixing this simple list of ingredients together can produce such a delicious treat.” A couple of weeks ago I cooked up a bag of garbanzo beans to make sweet potato hummus. Looking at all those beans cooked up, I thought to myself “too much garbanzo.” So I googled garbanzo recipes and found “Garbanzo and apple cake”! My husband loved it! Wow…sounds interesting…I’ll bet it was delicious, Georgette! It’s a keeper, Danielle and super simple to make. No eggs needed! I’ve been looking for banana bread recipes that look easy and delicious at the same time and I think you just brought me the perfect one 🙂 thanks! Oh, and nice blog you have. Thanks for your comment, Marwinna…I hope you have a chance to try it! It’s a great little snack cake…super easy ingredients and wonderfully flavorful. Thanks for your comment, Shanna… Enjoy your day! You are just so kind! The happiest of holidays to you as we head in to Thanksgiving week. Busy, busy…enjoy time with your family! Made this last night and it was such a hit that my daughter is making a couple batches today for a bake sale at school tomorrow!!! THANK YOU!